Periphyton is an important component within the littoral zones of lakes, but it is known to vary dramatically on small (cm–m) and large (km) spatial scales, showing differences in composition and abundance. 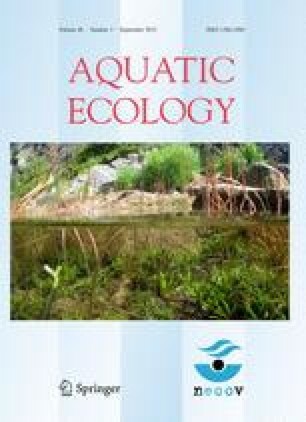 Until relatively recently, changes in periphyton composition along depth gradients have not been studied sufficiently and the response of small meiobenthic invertebrates inhabiting the periphyton to vertically changing environmental conditions such as light are poorly understood. To investigate the changing community composition of epilithic (on stones) nematodes along a depth gradient, we conducted a field study at Lake Erken, Sweden, with the specific objective to investigate whether changes in periphyton composition (algae, bacteria) are reflected in changing nematode feeding types and what the consequences are for nematodes and their resource consumption. We analysed the abundance, species composition and feeding type distribution of epilithic nematodes along 11 depth levels, from 5 to 300 cm water depth. Our study resulted in the first measurements of carbon (13C) and nitrogen (15N) stable isotopes in free living nematodes in lakes. Nematode community composition and feeding type distribution exhibited dramatic changes along the depth gradient. Nematode feeding types changed from a dominance of algae-feeding species in the shallow littoral zone to one of bacteria-feeding species in the deep littoral zone. The 13C stable isotope signatures of nematodes and the small (<20 μm) periphyton fraction changed with increasing depth, with nematodes shown to feed on this small periphytic component. Nematodes were identified as primary consumers by means of trophic level calculations based on 15N stable isotopes. We thank Kurt Pettersson at the Erken Laboratory for hospitality and support. Helena Hombeck helped with the field sampling. Wendy Ran edited the English of the manuscript. We thank two anonymous reviewers for their helpful comments on the manuscript. Financial support from the German Research Foundation (DFG–PE 1522/2-1) is gratefully acknowledged.